Attention: From Gocdkeys we show you where to buy Far Cry New Dawn, in cd key format for UPLAY, at the cheapest price and without having to move from home, since this version is a digital key of Far Cry New Dawn which simply you will have to introduce in your account of UPLAY to activate the download. 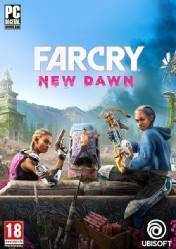 The price list shows from lowest to highest the best offers and prices for the game Far Cry New Dawn with the possible discounts for our users. This new installment of the Ubisoft franchise will plunge us into a post-apocalyptic world, 17 years after a global nuclear catastrophe. We will be one of the survivors and must lead the fight against the dangerous new threat posed by the Roadmen and their ruthless leaders The Twins, as they try to take over the last remnant. We must collect resources, team up and build weapons to defend ourselves from the ruthless gang leaders. We will be able to hire and recruit specialists to improve our base and its defences. Send expeditions to faraway territories in search of new materials and resources with which to create the best possible defense and survive this ruthless future. Uplay key activation method: This product is a digital version or cd key, which means that you simply have to access your UPLAY account and enter the cd key, or clave, that you will receive by email. The process is very simple and safe, and in a few steps, you can access your library of UPLAY games to play Far Cry New Dawn without any limit. There are no comments yet about Far Cry New Dawn. You can be the first one! Far Cry New Dawn Gameplay Walkthrough - Part 1 - HOW IT BEGINS..